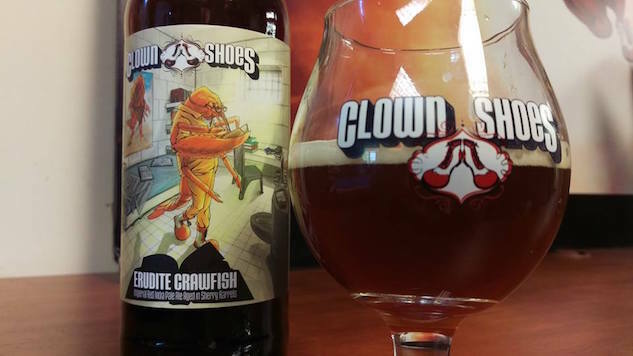 Contract brewing isn’t a dirty word, says Clown Shoes Beer, the nationally distributed beer makers born in 2009 and known to have some knowledge in, if not dirty, at least snarky beer names. With something like a million breweries now open in the U.S., beer drinkers are noting the different business models behind the brand: from small nano taprooms to behemoth national brands, there are all types of businesses that want to pour you their pint and feel their vibe. Paste reached out to Brand Manager Sam Geary to talk about how contract brewing has worked for Clown Shoes, and how the model has proved challenging. Their brewery is frequently releasing special one-offs and seasonals including a fall line-up of Presumptive Moninee IPA, Pecan Pie Porter, and Hammer of the Angry Beast. Oh, and Geary says they’re looking into their own brewery too. Paste: How did you get started? Geary: When we started it was more of a fun idea: Hey we didn’t win this contest on BeerAdvocate, let’s make our own beer. So we reached out to contract facilities and we hit it off with Mercury Brewing Company in Ipswich, who make Ipswich Ale and a few other brands there. Gregg Berman, who owns Clown Shoes, really hit it off with Dan Lipke, who was the head brewer there at the time. We were at the right time at the right place: the beer market was just budding in New England and probably the rest of the country. It wasn’t the scene it is today so we were able to get in there, get a 30-barrel batch going, and it sold really well. Since then we’ve kept Dan Lipke as the person who designs all our recipes. Last September, we hired him full-time to our company so he’s 100% our head brewer and developing everything. We still brew under contract at Mercury but we also go to Stony Creek in Connecticut and also Schmaltz in Upstate New York. Paste: Are there consistency challenges between locations? Geary: Because of the challenges, we make different beers in each facility. The majority of our 22 oz. and flagship products come out of Mercury. Paste: Does Dan brew or is it done by staff at one of the contracted breweries? Geary: Dan designs all the recipes and he’s in touch with brewers to make sure everything is dialed in to his standards. Last month we were designing a special release project where we dumped three batches before the 4th batch was completely to our standard, so he works really closely with the brewing team at each facility to make sure that everything in the package is 100% Clown Shoes. Paste: How has the contract model allowed the brand to grow differently? Geary: It’s allowed us to put everything back into the beer without having to rely on debt or keeping up equipment. We release a special project every month and get it out either nationally or to a specific market. It’s given us the ability to do that. In terms of personnel, it also allows us to get feet on the street. We have a full-time artist, Michael Axt. We have reps on the West and East Coast to be where we can’t from our home office in Massachusetts. Paste: Does contracting allow you to start bigger or grow faster? Geary: I don’t think so because with a larger batch you could end up with excess product that hasn’t been sold. If we had our own facility and we had to fill those tanks to make our investment back, we’d be flooding markets with beer that might not move as successfully. Paste: The trend in brewing seems to be small taprooms and face to face with customers right now. We’re working on it now. It will become reality soon enough. Paste: Are you looking at a destination brewery or more of a neighborhood hangout? Geary: We’re going to have a destination spot. We’re known nationally. Paste: Do you get people showing up at your office door with growlers to be filled? Geary: People ask if they can come visit. We’ll show you the offices and our warehouse and barrel aging, but we don’t have growler sales or anything like that. Ipswich Ale just opened a restaurant at their brewery and some of our rare bottles are for sale there. We direct people that way. You can get some of our rare state-only releases that you can’t find in Massachusetts. We direct people from outside Massachusetts to Sunset Grill in Allston. It’s one of the first and biggest beer bars in Boston and they usually have 6-12 tap handles for us there. We’ve made the Exorcism Series only available there. Paste: Do you get misconceptions about the business model? Geary: Three or four years ago we got a lot of flak. The idea of a contract brewer cast a shadow on us. I think people are more knowledgeable about the industry and know that we are concerned with the quality and making of the beer. We have a head brewer, we have some of the highest rated beers coming out of Massachusetts despite not having our own facility. You’ll see people putting out beer that’s contaminated and not that great, even with having their own equipment. Paste: What does Dan do? Geary: Dan’s almost constantly in contact with our contract partners. He knows exactly which batch of beer is at which stage of its life. [He has] over 20 years in the industry, and knows the equipment at Mercury. We store all of our barrels in our facility so he’s constantly out there. Paste: Is is his relationship with Mercury awkward? Geary: There is no bad blood. He was looking for a change in his professional life and this was an opportunity. He loved the brand, he created every recipe since the beginning. It gave him a chance to flex his brewing muscle and get creative and have a national brand behind him. Paste: Are you at the mercy of what’s going on with your contractor to meet demand? Geary: Everyone has their house brand and other contract brands in there. It is a battle for space, but it helps if you talk and keep in constant contact. I think technology has helped a lot in terms of everyone keeping on track with what’s happening. Communication is 100% the key to everything.